Too often we all get caught up on being just like an operator, however most forget attaching a single point sling without training does little more than to whack you in the balls as you run or transition to your pistol. Good old fashioned style slings that attach at the front of the handguard and and rear of the buttstock to carry a rifle over the should still deliver the best all around utility in all but entry level tactical situations. 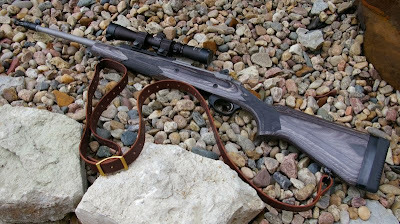 As I become more and fascinated by the whole Cooper Scout rifle concept, I realize we often forget about Cooper’s specification for an appropriate sling on a scout rifle. The sling was more than just something to carry a rifle, it was a key integral support mechanism for shots when support was not available. I wanted a sling that fit the intent of the Cooper concept on my Ruger Gunsite rifle. Andy’s slings are not made my some mega conglomerate which outsources mass production overseas. Would you believe it? Andy’s slings are made by Andy, the founder right here in the US out of high-end bridle leather. In the sea of mass produced slings, Andy’s Leather is unique in the market as a product that is superior in both materials and design. There is really not a lot to to a sling - some strap material, swivels, and rivets of some type. On the Rhodesian the strap material is all high-end bridle leather, with a proprietary brass adjustment buckle and brass Chicago screws as rivets. The design is absolutely bulletproof and bombproof. Not only is the sling designed to last several lifetimes it is beautiful. Andy has radiused all the edges and added a tasteful line along the edge. Swivels of choice are customer supplied. In this case, I slipped on a set of Uncle Mike’s swivels which mounted up to my Ruger Scout Rifle for testing. 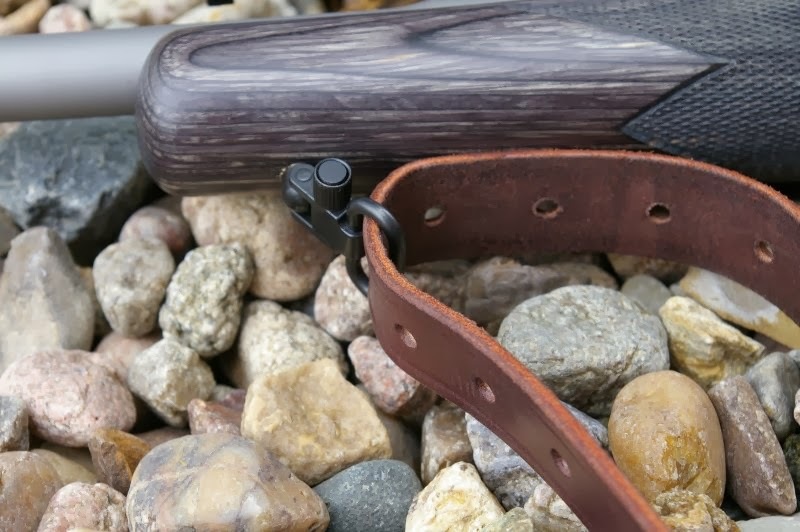 The overall design of the Andy’s Leather Rhodesian Sling is similar to the three point mounted Ching Sling design that Cooper recommended, however the Rhodesian will perform the basic Ching sling capabilities without a third specially placed swivel stud and extra sling weight. 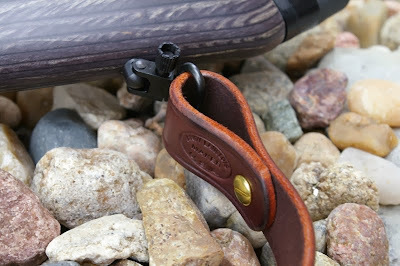 The Rhodesian also has a simple and very fast adjustment buckle system that makes it quick to adjust. Generally a sling will have three positions for the user; a tight/collapsed position, a carry position, and a shooting/bracing position. The tight/collapsed sling position keeps sling out of the way during shots when a hard shooting support is available. The carry position provides just enough slack to shoulder to comfortably carry the firearm. Finally the shooting/bracing position is typically a sling slack level someplace in the middle between the other two positions which allows the forearms to be “wrapped” to create a bicep to wrist brace for the rifle. In most sling designs there is a loop forward of the middle position to lock in the bicep, elbow, and forearm into the guns’ stock. Designs vary. The original Cooper Scout rifle specified a Ching Sling which is actually a three point design which unfortunately not used much due to the need for a third sling stud attachment and the specialized Ching Sling. If you like this option, Andy’s makes a great version. Most two point slings attached fore and aft to the rifle are used simply by looping the elbow around the sling and corkscrewing the forearm around the front sling ½ turn to lock the human arm appendage to the firearm and provide a much more solid shooting platform. The problem is that a standard two point slings front sling lays flat and can pinch uncomfortably during extended shooting. The National Match style slings are fairly comfortable to shoot from longer term by going a step further by featuring a special loop that locks on the bicep, but require full reconfiguration between the carry operation and the intended use. The Andy’s Leather Rhodesian Scout Sling is somewhere in the middle from a feature perspective with unique open front adjustable loop which is extremely comfortable to shoot from. 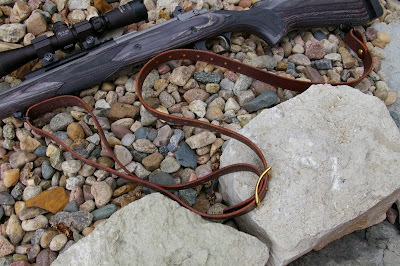 After the initial adjustment, the Rhodesian Scout sling allows transition from carry to shooting without reconfiguration. Once I had the Rhodesian sling properly adjusted, the featured I liked most was it was simple and fast to transition from carrying the firearm over the shoulder to slipping in my bicep in the open front loop and taking a shot. The open front loop is critical to the speed of use on the Rhodesian compared to other slings. I have used a Ching Sling before and one of the big benefits of that design was the open accessible front loop that you can get into quickly. That benefit is in the Rhodesian Sling design all packaged up in a simple, elegant, and high quality option that only retails for around $55. This is such a great sling, I will definitely have to pick up extras for ARs, 10/22s, AKs, Mosins, and other rifles which could benefit from the design beyond the Copper Rifle design. Is this the Walnut or Chestnut colour? I want to be sure before ordering one for my GSR. Chestnut I think... its been a while.